If there was any time for Of Mice & Men to finally prove themselves, it’d be now. Even if their first post-Austin Carlile album Defy was a rather lacklustre effort, that at least makes sense, a band scrambling to put any remaining pieces back together and not doing all that well. But the live environment can often prove to be a different beast altogether, and to give Of Mice & Men the benefit of the doubt, there are definitely grounds for their current brand of nu-metalcore to succeed here where it didn’t on record. That seems to be the case with both support bands too, particularly for Sylar (7). In the intersection between crushing, groove-driven metalcore and pummeling rap-metal, the New York mob find themselves hitting their stride remarkably early on, particularly in Jayden Panesso’s chugging flow that pulls more than a bit from the band’s clear NYHC influence. By comparison, Miguel Cardona feels as though he’s wandered in from a different band with his scrubbed-up cleans, but his more conventional modern metalcore contributions are never enough to upset the crushing wave of nu-metalcore that’s pulled off so well elsewhere. Give this band a much smaller environment and they could cause some serious carnage. Wage War (7), meanwhile, find themselves perfectly suited to a venue like this. Theirs is unashamedly a brand of big-room metalcore, though with none of the edges sanded down and some considerable heft to make up for a sound that’s not all that novel or varied. Then again, with killer cuts like Twenty One and Johnny Cash at their disposal, and Briton Bond having a rawness in his vocal timbre that rarely ever wavers or sounds like anything less than the most imposing presence in the room, the live setting is one where Wage War can fully let themselves loose with great effect. Judging by their work here, there’s an excellent metal band just waiting to break out. That also becomes true of Of Mice & Men (8) tonight, except they’re much closer. Yes, Defy didn’t do a lot on its own, but bringing that into an area where the band have a greater chance to make that work proves incredibly fruitful. For one, the strains of Five Finger Death Punch and Slipknot become all the move evident, with the powering arena-metal of the former imbued in Unbreakable and Would You Still Be Here, and the weapons-grade savagery of the latter coming through in the surprising heaviness that comes from these live renditions. There is genuine power here, particularly in a truly formidable guitar tone all the way through and Aaron Pauley serving as a far more effective frontman here than on record. 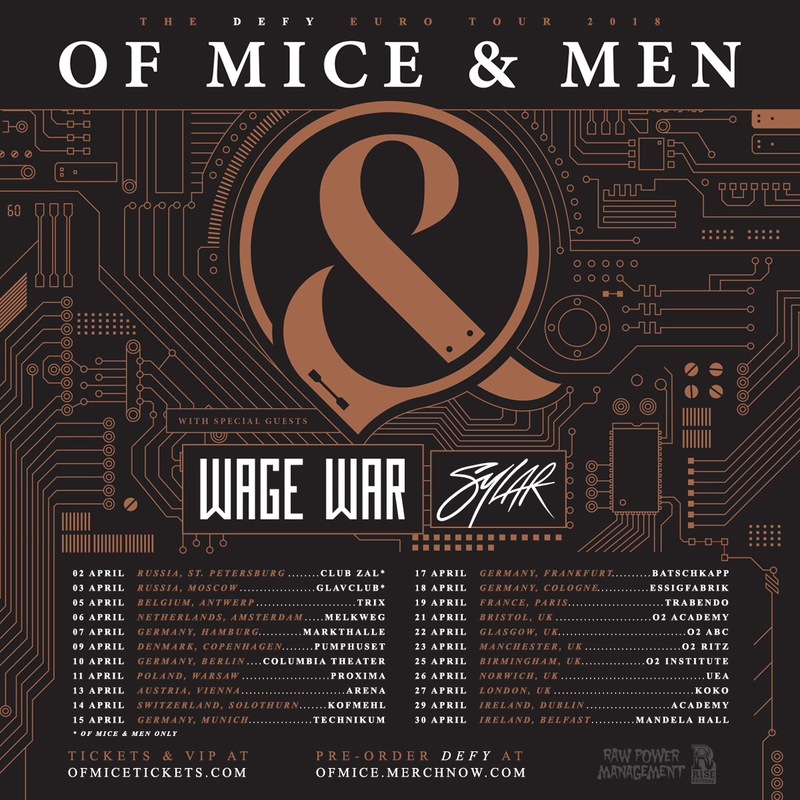 Of course, that’s with the benefit of a set tailored to accentuate just how far this incarnation of Of Mice & Men can go, and while that means the omission of some of their bigger, more recognisable cuts in favour of a focus on more direct newer work, that makes for a far more consistent set. There’s menace that comes through in Pain and Bones Exposed that breaks away from preconceived limitations of metalcore for something much more blunt and effective. But The Depths serves as an apocalyptic closer that does complete justice to what is still one of the band’s best songs, and a mini-retrospective through YDG! ?, Still YDG’n and Forever YDG’n indicates a band still in touch with their routes, and working to adapt it accordingly to their current sound with great effect. This definitely feels like a more comfortable, impactful Of Mice & Men than what their recent recorded work would suggest, and at least in the live environment, they’ve not come across as more – as it were – unbreakable in a long time. There’s definitely still mileage in this band after a turbulent recent time, and the sooner they can channel this more readily, there’ll be so much more to talk about.